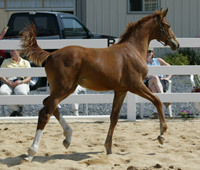 Our current Sales List includes weanlings and yearlings by several sires including our Hanoverian stallion Gold Luck. 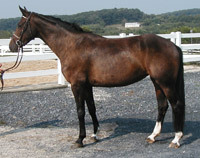 Check out the excellent riding horses available for sale! Additionally, Rolling Stone Farm has an extensive network of contacts, both in the US and Germany, to assist you in your search for the perfect equine partner. Please contact us for additional information. Our mares are carefully monitored throughout their pregnancies to produce the healthiest foals possible. After the foals are born, they are handled daily, placed on a proper worming schedule and receive regular farrier and veterinary attention. All of our horses are turned out daily in large pastures and in appropriate age groups to foster correct physical development, as well as good socialization and herd interaction skills. Our foals develop into healthy and loving young horses. 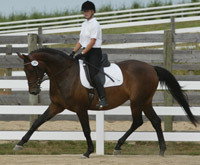 Typically we bring along several young horses to start under saddle. Each is sent for several months to a wonderful trainer who specializes in breaking youngsters. When they return they are comfortable in the basics and are ready to move on to more specialized training with our resident trainer. Since we place such a high emphasis on breeding for rideability and good temperament, these early lessons are usually very easy for our youngsters, and they are ready for their performance test or the show ring very quickly. Click to see our available under saddle horses. With such a large herd of established mares, we often have high quality broodmares for sale. Typically the largest selection is available after the spring foaling season. The young mares have been started under saddle and most have been performance tested as well. We can't keep everyone!